Whether you like them or not (and I'm not a great fan) Hawksmoor's churches certainly make an impact on London, if only by their sheer size. They range from large to enormous and I sometimes wonder whether there was an error of scale on the drawings and they got built much bigger than intended! All seven were constructed under the Act of 1711 which proposed to build '50 new churches of stone and other proper materials with towers or steeples'. This scheme was put forward by the Tories, partly to celebrate the fall of the Whigs after 22 years but also because law and order in the suburbs was thought to be suffering for want of churches. However only about 14 churches were produced of which the latter ones were re-builds of existing buildings. 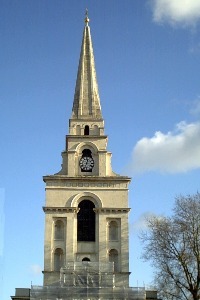 Hawksmoor was one of the surveyors of the commissioners and his designs, along with churches by Archer and Gibbs, were new builds. Perhaps the expense of these reduced the numbers - St Anne's for instance cost £32,232 8s 7d plus £400 for the site. 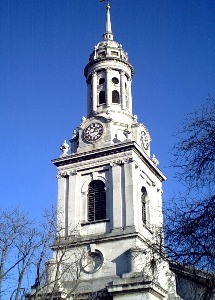 A catalyst to the Act was the loss of ST ALFEGE'S CHURCH in Greenwich, when the roof collapsed during a storm in 1710. The parishioners petitioned for funds from the coal tax as they were unable to finance a new church themselves. It was built against a surviving tower to reduce costs. 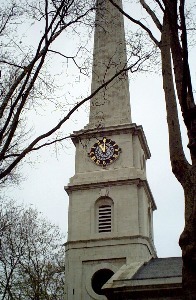 This was later encased and the steeple, designed by John James, added in 1730. 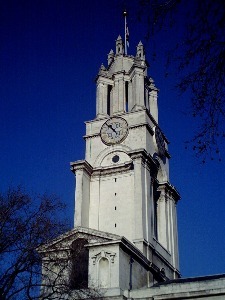 The designs for a tower that Hawksmoor planned were later used at St Anne's Limehouse. It was virtually gutted by war damage in May 1941 but restored by Sir Albert Richardson in 1953. General James Wolfe, killed at Quebec in 1759 and composer Thomas Tallis who died in 1585 are buried under the church. 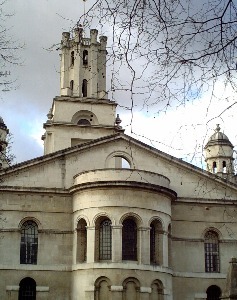 ST ANNE'S LIMEHOUSE is a huge, now gleaming white, church following cleaning under the LDDC. The restoration by Julian Harrap in 1983-93 added tubular steel trusses to support the roof and the surrounding grounds were also re-landscaped. However it is not easy to gain access. It was built over a lengthy period and was not able to afford a rector until 6 years after it was completed. The church was gutted by fire on Good Friday in 1850. The churchwardens collected door to door to add to the £5000 insurance money and it was restored by Philip Hardwick and John Morris. It was restored again in 1891 by Sir Arthur Blomfield and after WWII bomb damage. It has one of the highest clocks in London so as to be visable from boats on the Thames. There is a curious pyramidal tomb to the west of the church and drawings in the British Library suggest Hawksmoor may have planned pyramids on the turrets. 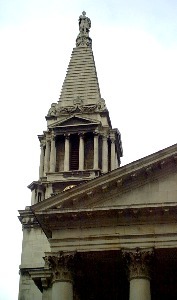 Another monster is CHRIST CHURCH SPITALFIELDS, one which very nearly became extinct! Little money had been spent on the church since its completion in 1714. The rotten state of the roof and ceiling meant that the church had to be closed in 1957 as a dangerous structure. The diocese thought to demolish it and sell its site but this led to the formation of the Hawksmoor committee who succeeded in stopping this. Money for repairs was raised by the sale of St John's Smith Square (gutted in the Blitz) for use as a concert hall. A Friends of Christ Church was set up to restore the building aided in 2000 by a Heritage Lottery Grant of £2.44m. The restored interior should be open to view on Tuesdays 11-3. The Museum of London recorded and cleared burials in the crypt which is now used as a rehabilitation centre for alcoholics. An old notice remains on the north side stating where keys to the church could be obtained in case of fire. It is a used as a venue for the Spitalfields Festival and there is a Friends website. ST GEORGE'S IN THE EAST is another church to have benefited from exterior cleaning and landscaping under the LDDC. It was burned out in WWII and remained as a roofless ruin until 1963 when a new smaller church and some flats were built within it. This unusual arrangement makes it worth a visit but do not miss the sorry-looking old mortuary building to the south [pictures]. This was utilised as a Nature Study Centre between 1904-1942 (the inscription is just visable over the door). There is lots of information on the church website. 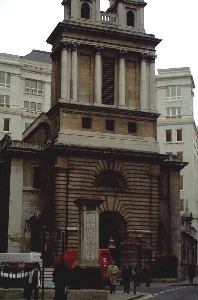 ST MARY WOOLNOTH is the only Hawksmoor church in the City of London and was built on a restricted site with blind sides on the east and south. It is unique in having an underground station below it! The City & South London Railway cleared the vaults (transferring the bodies to Ilford) for its construction in 1897-1900. The church was threatened with demolition five times between the 1840s & 1920s and the interior was altered by Butterfield in 1876. There is an unusual novel 'Hawksmoor' by Peter Ackroyd which combines the story of the building of the churches with a modern murder investigation.